In Chapter 10 of my book (pg. 388-393), Exploring BeagleBone, I describe how you can build web-based CGI applications that can interface with electronics hardware that is attached to the BeagleBone using Bash scripts that call C/C++ programs. The solution works well for very straightforward applications, but this discussion investigates more advanced solutions for applications where there are more complex interactions — for example, the use of web forms to pass data between your web browser and the application that is executing on the BeagleBone. In this discussion I begin by explaining how you can use a C/C++ program, rather than a CGI script, to display a web page. I then investigate the use of the GNU Cgicc library for more structured and complex interactions. The approach describe here will work on any Linux machine, including other embedded platforms such as the Raspberry PI; however, the steps are structured for the BeagleBone platform and the examples that interact with the hardware are specific to the BeagleBone platform — they can however be easily modified. In this example, the Apache server is used to serve the CGI applications, so having Apache installed is the only prerequisite software required. Apache runs on port 8080 of the BeagleBone by default when using the recommended Debian images — you can test that by opening a web browser and entering the IP address of your Beaglebone in the address bar using the following format: http://192.168.7.2:8080/ (replace the IP address with your BeagleBone’s IP address — the one listed is the default IP address for Internet-over-USB). can interface readily with hardware using the code libraries that I provide in the book. The downside is that it is not really suitable for novice programmers, the output format syntax can be verbose and session management is complex. Even with that, it is worth pointing out that some large-scale web applications, including those by Google and Amazon, do use C++ on their servers for performance-critical systems. The BeagleBone is not a high-end server, so any performance optimizations are always welcome, perhaps even at the cost of complexity. The first step is to write a simple C or C++ program that is capable of displaying a dynamically generated web page. This task is performed by a bash script in the book chapter, which is perfectly suitable but limiting, both in capability and performance. Common Gateway Interface (CGI) is a straightforward approach for building dynamic web applications — effectively it allows a web server to share more than just HTML files and/or static images. It does this by allowing executable scripts/programs in a certain file system locations (e.g., /usr/lib/cgi-bin/) to be executed by the web server, and for the output from the scripts/programs to be passed, via the web server, to the web browser of the user that made the request. CGI allows the user’s web browser to pass information (environment and application information) to the script/program using HTTP POST or GET requests. Almost all programming languages can be used to build CGI applications, as their only role in the transaction is to parse the input that is sent to them by the server, and to construct a suitable HTML output response. On the BeagleBone, the cgi-bin directory requires root access permissions. There are a number of different ways of solving this problem and that is for another discussion. Since the BeagleBone is not typically a multi-user server, I am going to be liberal in my approach to security so that we do not get bogged down in detail. If you are planning to make your BeagleBone publicly visible on the Internet, and place it in control of your home automation system, then you must investigate the topic of server security. To create a simple C++ CGI application the application can be deployed to the /usr/lib/cgi-bin/ directory on the BeagleBone by default. This directory requires superuser permissions in order to add a script/program — that issue is dealt with shortly. drwxr-xr-x 2 molloyd molloyd 4096 Mar 25 00:00 .
drwxr-xr-x 15 molloyd molloyd 4096 Mar 24 23:44 .. The build script executes the command “g++ hello.cpp -o hello.cgi“. Please note that the copy command is executed with superuser permissions. This is required as otherwise it would not have the access level required to create the binary executable (hello.cgi) in the /usr/lib/cgi-bin/ directory. This CGI program can then be called remotely from the web browser on the desktop computer, using the URL http://192.168.7.2:8080/cgi-bin/hello.cgi, as illustrated in Figure 1 below. Unfortunately, the approach that is described above is only really suitable for programs that make information available to the Internet. By default, C/C++ do not have the built-in libraries required to easily and effectively build interactive CGI applications — for this we need the Cgicc C++ class library. The GNU Cgicc is a C++ library for building CGI applications. It is powerful and it greatly simplifies the process of building common gateway interface (CGI) applications — those applications that allow you to interact with the BeagleBone over the Internet using a simplified interface within a web browser. As stated, there are other, more recent, approaches to building web applications, but GNU Cgicc offers an efficient high-performance solution. The final installation directory (for make install) should be configured to be /usr. This will ensure that the compiled library is made available to all users. 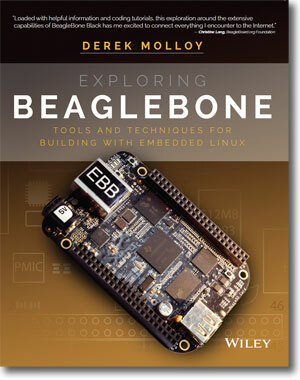 The final step is to install the compiled library for all users on the BeagleBone. Ensure that you execute make install with superuser permissions, otherwise it will fail to place the library files correctly. This would invoke the application “mygetapp” on the BeagleBone and pass the two variables, name1 and name2, that have the values value1 and value2 respectively. This is approach is quite straightforward and it is easy to construct request strings to be actioned from scripts or other applications. However, this approach should never be used to send sensitive information (e.g., passwords), as the URLs will be visible in server logs, browser histories etc. The test application is an LED controller that is very similar to the one that is described in Chapter 5 of the book. The on-board system LEDs can be controlled using the C++ LED class that is available to support that chapter. Figure 2 illustrates the application that results from the code in Listing 2. You can see in the address bar that the URL has the form “…/getLED.cgi?command=on” — the request URL consists of one name “command” that has the value “on“. By changing this value we can control the behaviour of the USR3 LED that is on the top left-hand corner of the BeagleBone PCB. After this request is sent, the USR3 LED lights constantly. The code for this example is presented in Listing 2 below. The code example uses the LED.h code that is used in Chapter 5. For convenience it is replicated in this project directory. access the on-board LED sysfs file system. See the web page for instructions. The chmod +s call sets the setuid bit — effectively the getLED.cgi binary is now executed with root permissions by Apache. If you perform a “ls -l” in the /usr/lib/cgi-bin directory you will see the “s” bit set on the binary to indicate that the setuid mode is enable. This is necessary because the LED code requires root access in order to modify the state of the on-board LEDs. Importantly, if this were a CGI script, I would be quite concerned at this point about script code injection. However, this is a CGI program that does not parse input fields. That said, it is not ideal and udev rules (see page 247 in the book) are a better solution for non-root resource access. The code in Listing 2 does not take full advantage of the Cgicc library — for example, it still manually generates the header output. That will be further improved in the next example — so please keep reading, even if you only require HTTP GET functionality. Figures 3 below illustrates the other functionality that is available in this application. You can trigger the LED to flash at a fixed frequency, or you can request information from the application about the current status of the LED that is made available via sysfs. All of these changes have an immediate effect on the USR3 LED and it behaves as you would expect. The second example that uses the Cgicc library is a HTTP POST example. The POST example allows you to interact with a form that contains checkboxes, radio components, buttons, text fields etc. For example you could use the HTML code in Listing 3 to display a form that passes data to the Cgicc C++ application. That is not required in this example, as the postLED.cgi application generates this code dynamically and adapts the rest of the page to represent the current state of the LED. The operation of this example is best understood by watching the animation in Figure 4. You can see that this application changes its output to display the state of the LED, and therefore it appears to be stateful. That is only possible in this example because the HTML form “stores” the “application” state — on each occasion you click the Execute Command button the postLED.cgi application executes afresh and runs to completion, thus losing its state. The expected state is only retained by the HTML form. The full source code for the Cgicc HTTP POST example is presented in Listing 4 below. It is important to note that this is the only source code required! The application generates the HTML form, which calls itself, over and over again. Just like the getLED.cgi application, the LED3 output changes instantly and appears as you would expect. easily receive the input from a regular HTML page. command = "off"; // if it is invalid use "off"
cout << "<div>LED state: <input type=\"radio\" name=\"command\" value=\"on\""
<< ( command=="on" ? "checked":"") << "/> On "; // is the command="on"? cout << "<input type=\"radio\" name=\"command\" value=\"off\""
cout << "<input type=\"radio\" name=\"command\" value=\"flash\""
cout << "<div>Flash period: <input type=\"text\" name=\"period\" size=\"6\" value=\""
if (command=="on") led3->turnOn(); // turn the LED on? else if (command=="off") led3->turnOff(); // off? This program has some interesting features. In particular, it uses functions such as HTTPHTMLHeader(), html(), body() etc. to generate the HTML content for the output. This is much less verbose that in Listings 1 and 2 and is less prone to error. There are many more such functions that can be used to further clean up the code. The code example also demonstrates how to interact with radio buttons (command), checkboxes (status), and text inputs (period) within HTML forms. is a clever piece of code that compares the command string to the string “on”. If they are equal then the word “checked” appears in the HTML form at that point in the code (thanks to the output stream operator <<); however, if they are not equal then the string “” (nothing) appears at that point in the HTML code. This allows a radio item or checkbox item to remain checked or unchecked. Finally towards the end of the program the command is processed and the code to display the status is placed. This line of code will display the shorter of the strings s and t.
This discussion has just scratched the surface on what can be performed using CGI and C++ on the BeagleBone. For very complex applications you may be better placed to examine other frameworks, but for simple high-performance web interfaces, the GNU Cgicc library provides a very appropriate solution. There are several limitations with the current solution. It is a single session solution -- If two users, on two different machines, access the postLED.cgi script at the same time then very strange things will happen! For example, each browser will store an independent state that is likely to be contradictory. However, given that there is only one USR3 LED on the BeagleBone PCB that is not a very significant issue. For more complex applications, session management is important. For more information on the Cgicc library please see the GNU cgicc library documentation. You will see that the library is capable of handling cookies, file transfers and much more by browsing the Class List. you tought me much things thru your videos. Your book shows very good the capabilitys of this technology. Extending the book by a website with further information is great concept. I don’t want to know, how much time this project took and will take. I never thought that i am able to understand how to turn on a led thru a mobile on my BBB or to write code on my desktop and deploy it automatically to another. I have to thank you very, very much! Thanks for your support Foikei, It took a long time to put everything in place! Great to hear that it has made a difference! Derek. Hi Derek, I just wanted to say, Thank you! These stuffs are brilliant. Not that I learned to implement my C++ programming skills in server side, I was able to develop a Java program that runs on Android, which I will use it in my thesis for my B.Sc..
You Helped me a lot with your book and your website and videos. Frankly speaking, you helped me to become the Geek (Person) I wanted to be! Again, adore your book and your website and your youtube videos. I tried the first example (the “hello.cgi” one) and seemed to be stuck. When trying to connect to “IPADDRESS/cgi-bin/hello.cgi” it would not be able to connect and I would get a 404 error. I feel like I am missing out a step with the configuration of the Apache2 server. Was there some pre configuring that was required?